Want to know my favorite site for finding incredible deals and savings? I've included it in my favorites today and I know you're going to love it too! Look for the link down below. I've got a lot of information to share about these products so let's get right to my favorite things. I've gone through so many planners the past few years that I've honestly lost count. They're always too small, too large, not lined well enough, lined too much, and many other fickle reasons. The truth of the matter is that I'm just really picky about the layout and size of my daily planner. I tried Google calendars for a while but it just wasn't for me. I'm on the computer a lot for work and anytime I can take a break from staring at a screen, I will. However, if I'm not on my computer then I'm not looking at my calendar. If I'm not looking at my calendar then I'm missing appointments and to-do lists because I have the worst memory. All this to say that I'm still very attached to scheduling my events on paper, the old fashioned way. I felt like I'd hit the jackpot when I found this calendar at Target. It's the perfect size where I can schedule an entire day but also still fit it in my purse. It also places the dates horizontally which is what I prefer. I've talked a lot about my son's eczema here on the blog and just when I think we've found the magic product, it seems to stop working and he has another flare up. I saw this lotion recommended by someone else who suffers from eczema and decided to give it a try. We've used the original Aveeno (green cap) but it didn't seem to help. But we really feel like we hit the jackpot with this one! We tried it on a really red and itchy spot on his arm and it was almost completely healed just a few hours later. Those are the kind of results I look for when it comes to helping my little one! I highly recommend it even if you don't suffer from eczema or just have really dry skin. I used to be that parent. I would say things like, "I'm not going to spend tons of money on kids shoes. My son grows too fast and there are affordable options out there!" In a way I was right, you can buy shoes for your children at a great price. But the catch is that they are usually really stiff (I'm looking at you, Target) or they just quickly fall apart (Hello, Walmart). 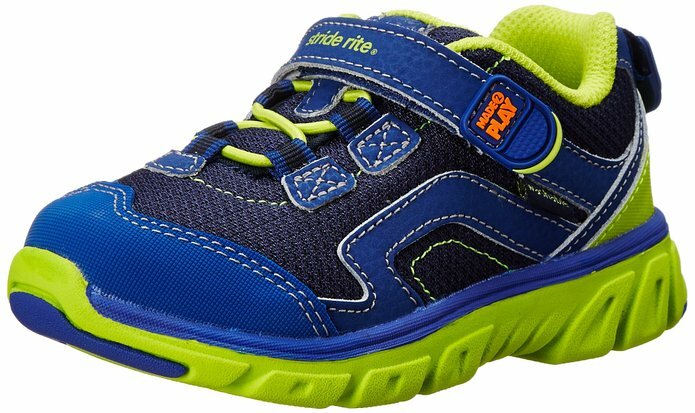 Stride Rite's Outlet was having a great sale for Memorial Day and we scored a couple of pairs for less than what they charge at Target. These shoes are amazing if you can find them at a great deal! Other brands seem to be stiff and harder to open wide enough to put those adorable, chubby toddler feet inside. I know some parents prefer a lot of structured shoes for their kids, but my son walks better in shoes that easily move with the flex of his feet. I am a walking history of bad hair days. I have thick, frizzy, and naturally wavy hair. Combine this dilemma with the Texas humidity and I look like a poodle most of the time. I finally hit a point in my life where I decided it was worth it to put more time in my hair. That effort is really paying off! I've been using TRESemme's 7 Day Keratin Treatment and the Keratin Serum for a while now and I'm the happiest I've ever been with my hair. It is finally shiny and smooth! And at this affordable price, this product is such a score. My last favorite to mention isn't really an item but is the greatest coupon/savings site of all time. Collin Morgan created the blog and does an incredible job of keeping the site updated with fresh deals and steals. It was on Hip2Save that I found a North Face toddler sweater for $12, as well as more Stride Rite shoes on sale for $20 (yes, $20!). If I hadn't purchased a pair the week before I would've grabbed more. I know we're all looking for ways to save money over the holidays. Be sure to check out this site for some awesome deals that could be used for presents! Older PostWays to Give During the Holidays for KIDS!